Many electronic circuits need a direct current (DC) voltage source, but what we commonly find are voltage sources of alternating current (AC). In order to achieve a direct current voltage source, the alternating current input must follow a convertion process like the one shown in the chart below. 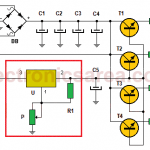 The chart shows the operation of a voltage power supply using a block diagram. It also shows the waveforms at the beginning (AC input), at the end (DC output) and between each of the blocks. Input signal which goes to the primary of the transformer is a sine wave and its amplitude depends on the country where we live (110/220 VAC or other). See the basic units of measurement in electronics. The electrical transformer receives on the primary winding an AC voltage and delivers on the secondary winding a different AC voltage (a lower one). This AC output voltage must be according to the DC voltage we want to obtain at the end. For example: If we want to obtain a final DC voltage of 12 volts, the secondary windings of the transformer must have an AC voltage no less of 9 volts. The peak value on the secondary winding of the transformer will be Vp = 1.41 x 9 = 12.69 volts. Even thought this value is very close to the one we wanted to get, it is not recommended because we need to take into account that the voltage drops at different stages (blocks) of the power supply. On this case, we can choose a transformer with a 12 volts AC secondary winding. With this AC voltage, we can get a peak voltage of: Vp = 12 x 1.41 = 16.92 volts. The rectifier transforms the secondary winding AC voltage into a pulsating DC voltage. (look at the diagram. In our case, we use a ½ wave rectifier, then we eliminate the negative part of the wave. 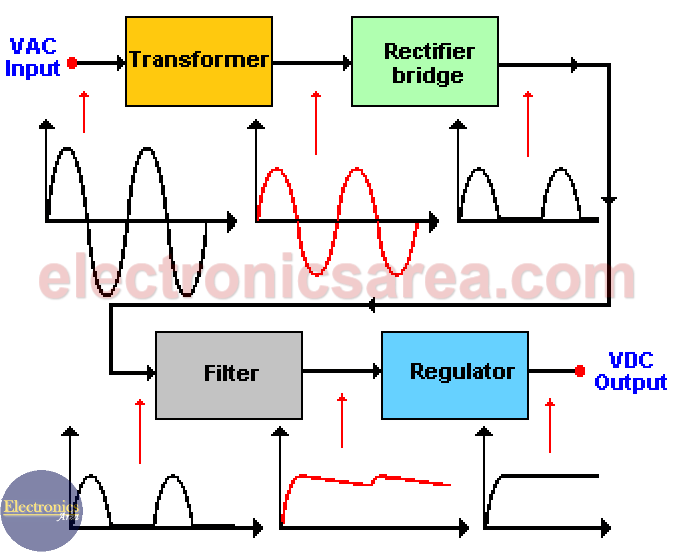 The filter, formed by one or more capacitors, flattens or smoothes the previous wave eliminating the alternating current (AC) component delivered by the rectifier. 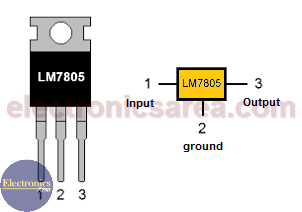 These capacitors are charged to the maximum voltage value that the rectifier can deliver, and they are discharged when the pulsating signal disappears. Look at the picture above.